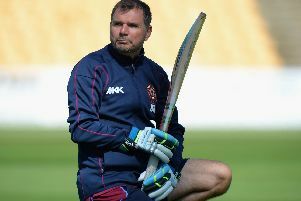 Adam Rossington was happy that his run blitz had helped Northants pick up four bonus points on day three of their County Championship Division Two clash with Kent. Rossington smashed a superb 78 from just 69 balls, including nine fours and three sixes, as the home side eventually made their way to 498 all out. That left Kent trailing by 102 runs, but the visitors refused to crack under pressure in their second innings and finished the day on 88 for one. And though he is disappointed that Northants couldn’t make the most of their lead before the close, Rossington was at least satisfied with the batting display. “It took time to get the pace of the wicket but it was important to try and move the game along a bit and pick up some bonus points too,” he said. “We set up a platform yesterday and we had the chance to kick on today. A third draw in three matches at Wantage Road now looks likely with Daniel Bell-Drummond (45no) and Joe Denly (18no) digging in for Kent late on. Northants applied some pressure with Monty Panesar and off-spinner Rob Keogh operating for most of the evening session and the odd delivery misbehaving but for the third match running, weather may deny the chance of seeing what a full four days of deterioration may produce at Northampton. The hosts will be frustrated after building up a useful lead in the afternoon with fifties from Rory Kleinveldt and Olly Stone. Kleinveldt struck six fours and six in his 43-ball fifty - his second of the season - adding a stand of exactly 50 with Stone for the ninth wicket. It followed the rapid progress with Rossington earlier in the day - the pair put on 70 in just 53 balls - before Rossington fell caught behind in the fourth over after lunch. The wicket of Rossington stymied the charge to a big lead but Stone raised a maiden fifty, brought up in 83 balls with eight fours and celebrated with a little punch of the air. He shared a record partnership for the 10th wicket for Northants against Kent - 49 with Panesar. The No.11 should have been caught in the slips without scoring when the score was 449, but the miss allowed Northants to build on a sprightly half-century from Rossington in the morning session. They began the day 190 behind but by lunch had reduced the deficit to just 30. Rossington has been in good touch this season and here showed power, excellent timing and the odd deft touch too in reaching his second fifty of the year in only 46 balls with five fours and three sixes - two of them slog swept off Darren Stevens, who only bowled two overs on day three and did not field for most of the afternoon. Kent did chip away with three wickets. Richard Levi fell to the first over of the second new ball, driving Mitch Claydon to Stevens at first slip. Josh Cobb played the same stroke to the same fielder to give Imran Qayyum a maiden first-class wicket - he finished with three for 158. Matt Hunn also struck, taking out Keogh’s off stump for nine in his first innings of the season. But it was Northants’ morning with Rossington in particular helping them add 160 runs in the session - comfortably raising a fourth batting bonus point.